The vertex of a quadratic equation is the minimum or maximum point of the equation. 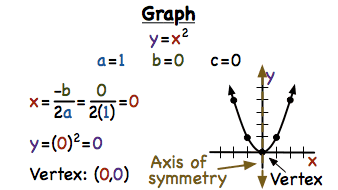 Did you know that you can use the formula for the axis of symmetry to help find the vertex of a quadratic equation? Watch this tutorial and see how it's done! When you're trying to graph a quadratic equation, making a table of values can be really helpful. To figure out what x-values to use in the table, first find the vertex of the quadratic equation. That way, you can pick values on either side to see what the graph does on either side of the vertex. To see how to make a table of values for a quadratic equation, check out this tutorial!